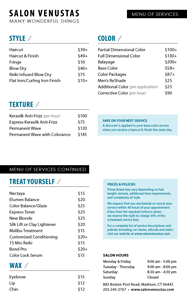 *Prices listed may vary depending on hair length, texture, additional time requirements, and complexity of style. We request that you reschedule or cancel your service within 24 hours of your appointment. If less than the required notice is given, we reserve the right to charge 50% of the scheduled service fees. Copyright © 2019 Salon Venustas. All Rights Reserved.